Seward's growing popularity in the past several decades cannot be chalked up to a single proposal or program. 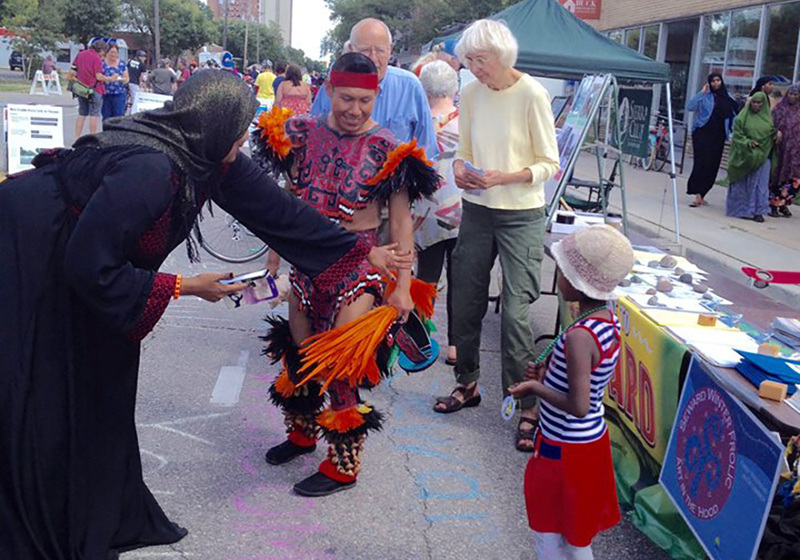 A wide variety of initiatives supported by this engaged and diverse Minneapolis community has helped build an improved quality of life for all. 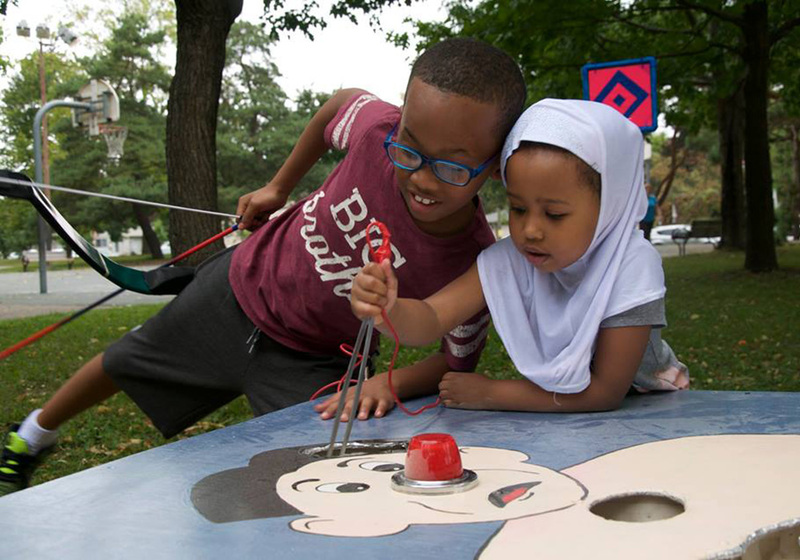 True to the Minnesota tradition of civic engagement, Seward has 50 block clubs that form the greater Seward Neighborhood Group, keeping neighbors apprised of local developments and promoting cross-community social ties. 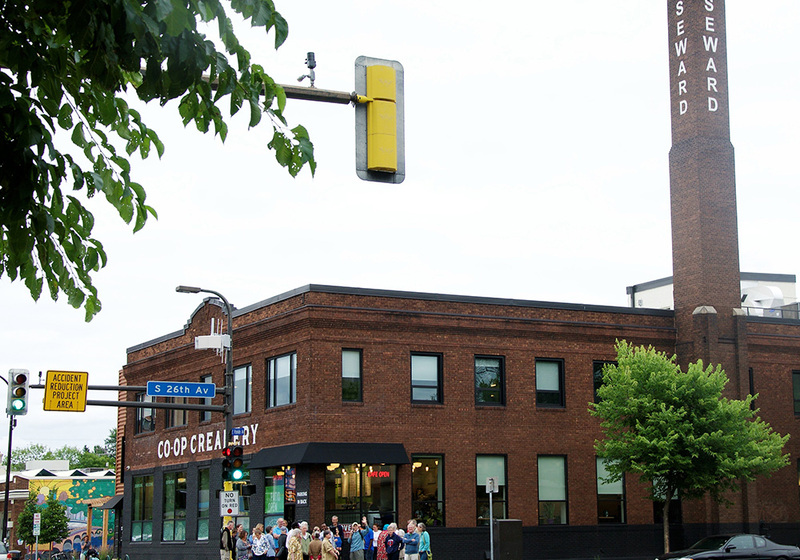 Neighbors gather outside the Seward Community Co-Op for one of the weekly summer history walks, this one featuring the many East African businesses along Franklin Avenue. Photo courtesy Liza Davitch. Residents are encouraged to participate in the Seward Neighborhood Group, planning-focused Seward Redesign nonprofit, and the business-focused Seward Civic and Commerce Association — organizations that have been instrumental in ensuring that the neighborhood is hospitable to new local businesses, promoting a vibrant commercial corridor along Franklin Avenue, and guaranteeing a variety of retail and dining opportunities. Promoting variety requires a socioeconomically diverse community, which has been sustained through Seward's efforts to preserve affordable housing options for residents. The neighborhood's housing stock is broad, ranging from the 19th century planned worker's community found in the Milwaukee Avenue Historic District to modern yet affordable apartments developed by the Neighborhood Revitalization Program. Seward is a testament to the value of diversity when it comes to community building, economic resilience, and neighborhood stewardship. As it says in the neighborhood's Affirmative Inclusion Statement: "All are welcome here." Seward takes pride in celebrating its diversity. The Seward Neighborhood Association has an Affirmative Inclusion Statement which "recognizes that this diversity is part of our strength and character." Photo courtesy Seward Neighborhood Association. Seward offers access to a number of public facilities and parks including Matthews Park, the Matthews Recreation Center, and the Mississippi Gorge Regional Park. The neighborhood features biking and hiking trails that are part of the Grand Rounds Scenic Byway, a 2009 APA Great Public Space. Additional bicycle infrastructure in the neighborhood includes the Midtown Greenway and the Hiawatha LRT off-street trails, and a comprehensive network of on-street bike lanes. The neighborhood hosts the Seward Co-op grocery store and the Seward Community Café Co-op. Seward is a cultural hub for Minneapolis as it features the Northern Clay Center, Articulture teaching center, and the Playwright's Center. The neighborhood offers many annual community-building events including the King's Fair, Winter Frolic, National Night Out, and Seward Garage Sale Days. Seward is connected by light rail transit and high-frequency bus access to the region's jobs and entertainment centers such as Downtown Minneapolis, University of Minnesota, and Minneapolis-St. Paul International Airport. The neighborhood is bordered by I-94 to the north, Hiawatha Avenue to the west, the Midtown Greenway next to 27th Street East to the south, and the Mississippi River to the east. Seward hosts the King’s Fair in September, bringing the neighborhood together at Matthews Park with a costume parade, local artwork, family-friendly games, and more. Photo courtesy Liza Davitch.